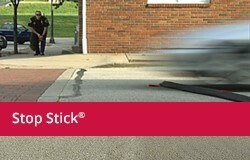 CINCINNATI, OH – May 30, 2018 Effective and safe use of the Stop Stick® Tire Deflation Device has earned Officer Joe Stark the 2017 “Hit of the Year” award. An assault with a weapon call, attempt to elude, and harassment threat to kill made this situation uniquely dangerous to law enforcement and the general public. 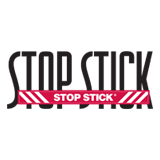 The Hit of the Year and Hit of the Month program recognizes the very best deployments of the Stop Stick® Tire Deflation Device in ending pursuits across the country. 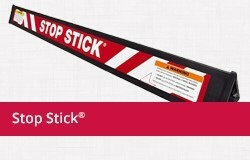 A top deployment in the Northeast, South, Midwest and West are voted on each month to nominate the Hit of the Month winner. Those 12 Hit of the Month winners are then eligible for Hit of the Year. In July 2017, Officer Stark, who was then employed by the Monroe Police Department in Monroe, WA, was persistent in successfully locating a vehicle reportedly being driven erratically by a male suspect. According to multiple callers, including a female kidnapping victim, the suspect had taken the female victim into the vehicle with a knife to her throat. According to the pursuit report filed by Sgt. Paul Ryan, also of the Monroe Police Department, the incident escalated quickly, putting the community at large in danger. This included threats to motorists and other law enforcement officials. Ryan indicated that the suspect aimed his vehicle at law enforcement and attempted to collide with them. The report also stated that the suspect later admitted his intentions to commit suicide by cop if confronted. In addition to holding a knife to the victim’s throat, the suspect had poured gasoline on himself and the victim and planned to light them both on fire. Luckily, the victim was able to break the lighter, thwarting the suspect’s attempts. 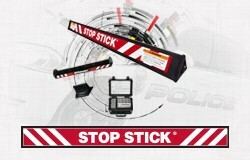 In 2017, there were 2,047 pursuit reports submitted to Stop Stick, Ltd. All deploying officers received a letter of accolade from company president Andy Morrison along with a Stop Stick “Hit Pin” after successful use of the device. 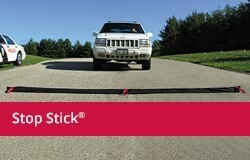 Hit of the Month and Hit of the Year recipients further demonstrated excellence in deploying Stop Stick taking several key categories into consideration: Danger to law enforcement and general public, effectiveness of device leading to apprehension of suspect resulting in no loss of life or serious injury, and the deploying officer demonstrating safe cover as recommended in Stop Stick user training.